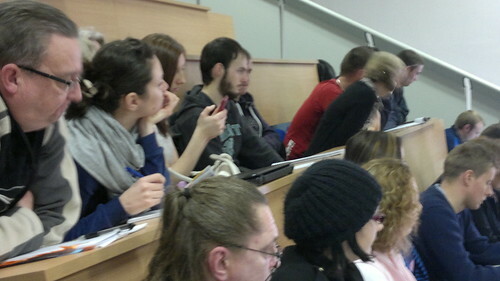 Photo by @topgold during an active learning lecture. ALTHOUGH I DON'T EXPECT to see student loans as an essential part of the third level system in Ireland before I retire from it in 1105 days, I fully anticipate co-signing a loan to help my under-10s attend the higher education institution of their choice. That's because the Irish government simply does not have the budget authority to restore funding to higher education at the level it once provided. The fiscal reality is driven by European restrictions. When I first arrived in Ireland in the late 90s, Ireland could just print money or run to the international markets for a sovereign bond to get the funding line necessary to finance third level colleges and universities. But now, a financial black hole is leading to the concept of users paying. Take the case of Trinity College Dublin, Ireland's best-known institution of higher learning. The Trinity balance sheet shows income has grown steadily steadily since 2011 when it was €312 million and more than €321 million in 2015. That’s revenue comes from a combination of student fees (up from €111.9 million to €128.9 million), research grants (up from €78.5 million to €85.2 million) and commercial revenue (up from €21.2 million to €29.1 million). The Trinity P&L sheet shows the college's state grant has plummeted from €66.7 million in 2011 to €44.5 million in 2015--at the same time its costs have risen. The staff bill has gone from €219 million to €230 million contributing to a total operating expense in 2015 of €325 million up from €303 million in 2011. This same story is repeated throughout the higher education sector. I work in the Limerick Institute of Technology and spend most of my time on a remote campus in Clonmel. That highly efficient facility has to fight for scraps. Lecturers there dig deep to find assets required to teach highly technical concepts with extremely limited assets. In my case, we have the basic equipment required to introduce virtual reality inside an advanced academic module only because I personally bought headsets and commercial subscriptions. Clear budgetary priorities exist and there would be major repercussions if the heating failed or staff weren't paid. When I snapped the shot accompanying this blog post, more than 70 per cent of the income paid to run third level education came from the State. Now less than 15 per cent is coming from the State and that line item continues declining. Heads of the third level sector spend more time lobbying the government to spend more money on third level education at a time when louder voices point to more severe challenges surrounding hospital trollies and homelessness. The major problem I see is personal--I have two children who represent a major demographic trend facing higher education. Ireland remains one of the global economies to have an expanding young population. The third level sector will have to accommodate "something like 20 per cent more people coming into higher education by 2028 than we have now," says Patrick Prendergast, provost of Trinity College Dublin. "That's 20 per cent more on an already underfunded system. They're Department of Education and Skills figures -- these kids are already born." And they include our five year old and nine year old, two children who I need to begin an inviolate savings plan. I personally do not believe the costs of attending third level institutions will ever decline. I read Peter Cassells' report from early 2016 and I believe the era of student loans will arrive before my eldest applies to the CAO. This means my two children will face a mountain of student debt before they start their first full-time job. The scheme many savvy thinkers propose involves relatively modest loans taken out that can be paid off when income reaches a certain threshold. "The main thing about these loans is that they're income contingent," Prendergast told the Sunday Busines Post. "You don't pay back until you get earning at a certain level." From my perspective inside the third level sector, there needs to be a calm and rational discussion about the public good and the private good. If a truly expert group proposes a student loan programme, it should be empowered to specify how it might work. I see this concept landing on the doorsteps of Irish credit unions and banks. And I also believe the lowest income families will still get grants to get a college education. Every month, someone I respect talks or writes about the need to change the underfunding model embraced by the Irish State. I wish we could face up to the fact that the current funding model is broken rather than trying to depend on lecturers like me to take pay cuts, pay additional levies and to fill the gaps by buying technology, paint and consumables in order to meet the higher education expectations of students and employers. +++ Bernie Goldbach teaches creative media for business in the Limerick Institute of Technology. Patrick Prendergast was quoted in "We have to design a system that suits the Irish situation", Sunday Business Post, December 4, 2016.